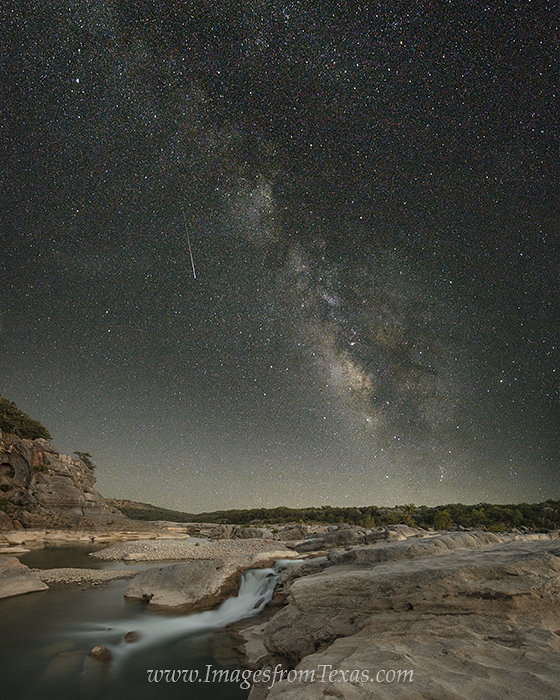 On a warm August night, the Milky Way glides across the Texas Hill Country. This view looks south a few hours after sunset. In the foreground, a section of the Pedernals River tumbles over rocks and makes its way through the winding rocky valley. This nighttime image was taken a few days before the peak of the Perseid Meteor shower, and during the long exposure of the Milky Way, a meteor streaked acoss the sky. I’m not sure this meteor was part of the Perseids because they originate from the northeast, but it was a nice addition nonetheless. On a warm August night, the Milky Way glides across the Texas Hill Country. This view looks south a few hours after sunset. In the foreground, a section of the Pedernals River tumbles over rocks and makes its way through the winding rocky valley. This nighttime image was taken a few days before the peak of the Perseid Meteor shower, and during the long exposure of the Milky Way, a meteor streaked acoss the sky. I’m not sure this meteor was part of the Perseids because they originate from the northeast, but it was a nice addition nonetheless. Photo © copyright by Rob Greebon.